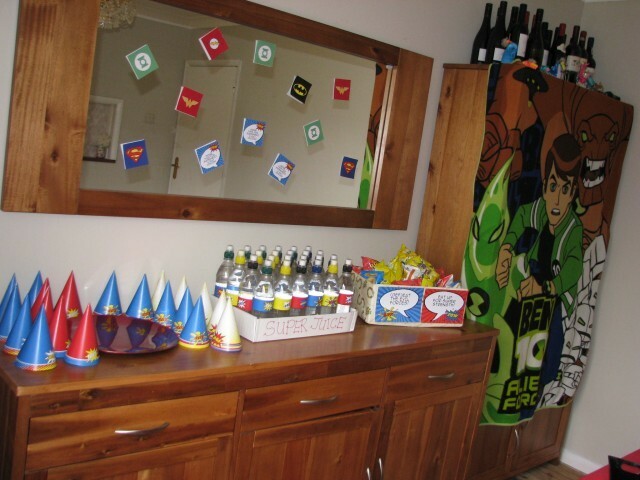 Superhero party planning is such fun. 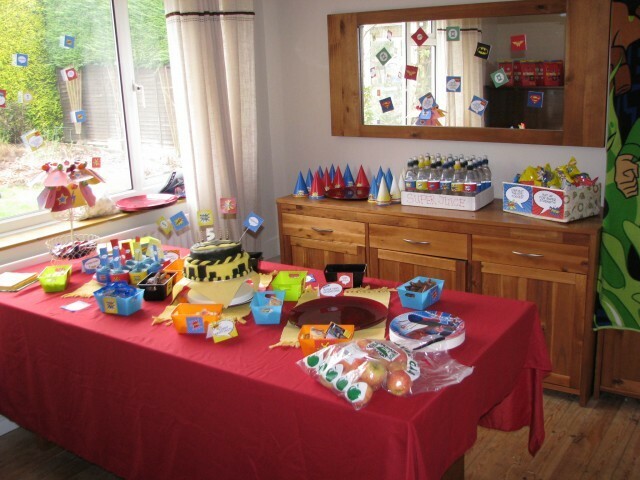 I had a great time coming up with food themed for the day and found it a great help to use a ready made party pack to help label and decorate the food and drinks I had on offer. I purchased a rather lovely superhero pack . It has printable and customisable invitations and other items. You can see how I’ve used them in the images that follow. I bought a multi-pack of flavoured water and removed the labels. (There were lemon, apple, strawberry and raspberry flavours) I printed out the drinks sleeves and used double sided tape to adhere them to the bottles. I placed them all in a cardboard tray and labelled it Super Juice. 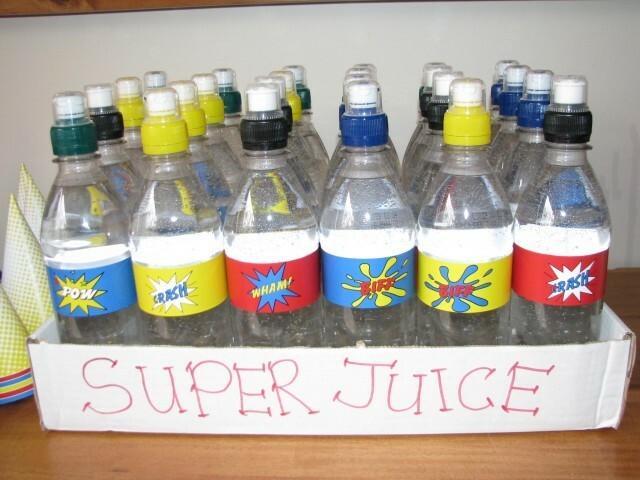 The kids loved it and my own children kept asking for super juice for weeks after the party. I like to use bottles at parties as it minimises spillage! Oh, I used a black permanent marker to label the bottles with the children’s names so that they could find their own one again once they’d set them down. Using the cones from the printable pack, I made a popcorn area. The huge bowl of popcorn is missing from the picture and the other photo I took of it with the popcorn is very blurry, but the children were able to take a cone each and fill it from the bowl. 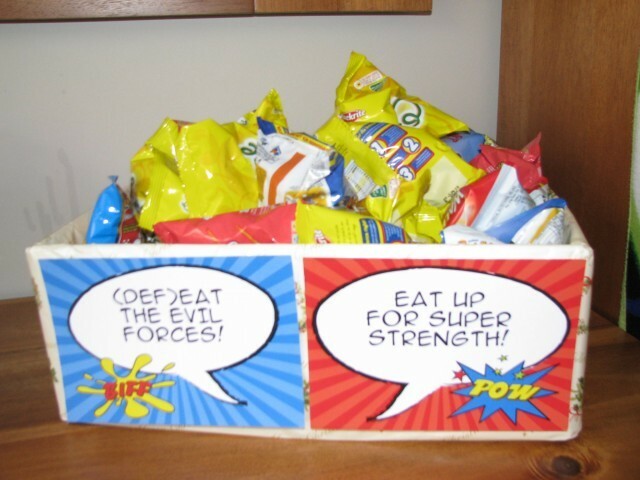 A box full of different flavour crisps/chips was labelled (def)eat the evil forces and Eat up for super strength. I made my boy’s favourite flavour cupcakes, lemon, and covered them in a vanilla icing coloured blue to match the party theme colours. 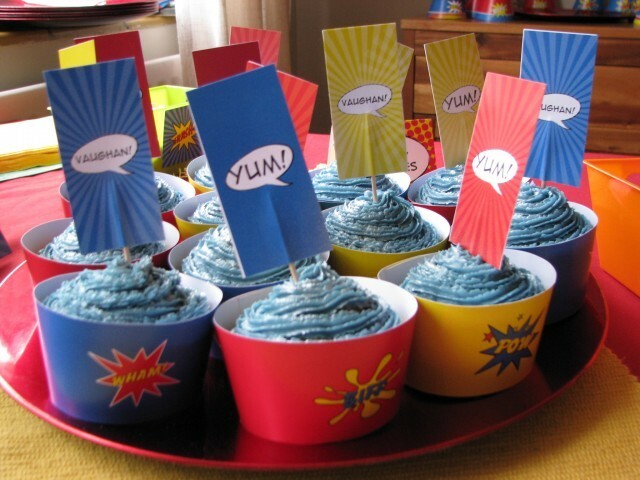 I used the cupcake wrappers and toppers from the printable pack to decorate them. They look great! 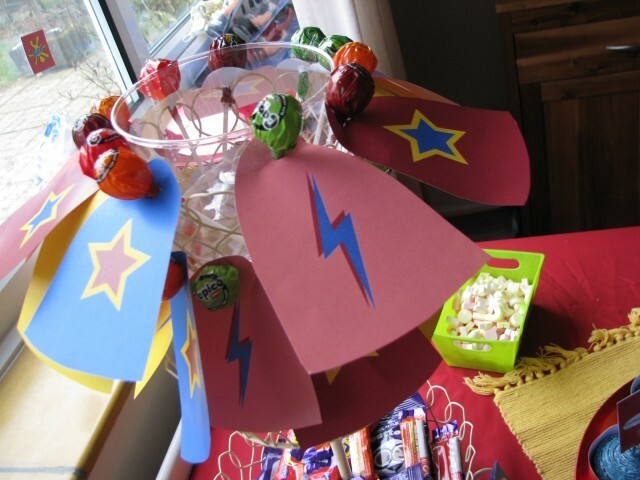 I found some superhero printable capes to be used on lollipops and dressed up the lollipops, assembling them on a cupcake stand. The bowl in the centre was plastic with small holes punched in it to stick the lolly sticks into. The dining room was the designated area for collecting food and drinks. The plates were paper plates with Spiderman motifs on them. One of my favourite parts of my children’s birthday is making the cake they want. 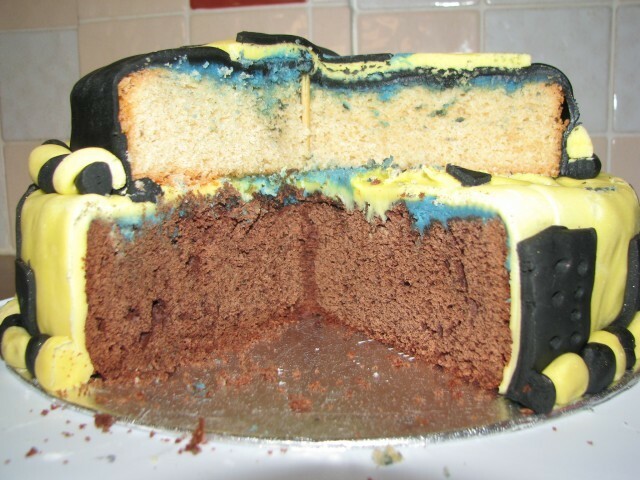 After a considerable amount of time (for an almost 5 year old) on the web looking for images of superhero cakes, he settled on a concept of two layers with superhero colours. 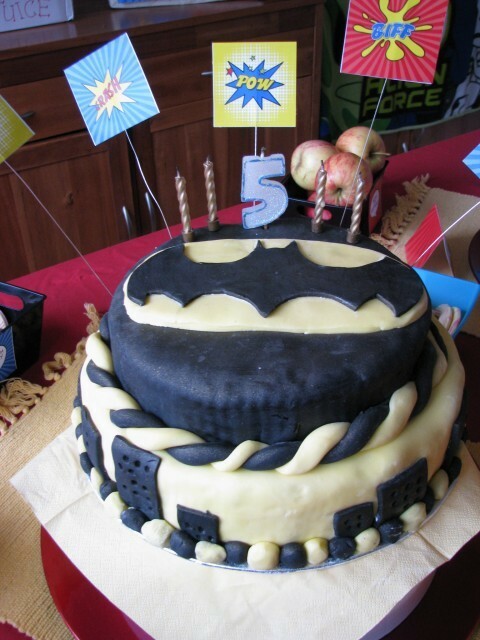 He chose Batman as his cake colours. I made a larger bottom layer in chocolate and the upper layer in vanilla. Covered it all in ready roll icing in yellow and black. It was truly simple but looked really effective and superhero-ish! And it tasted great. 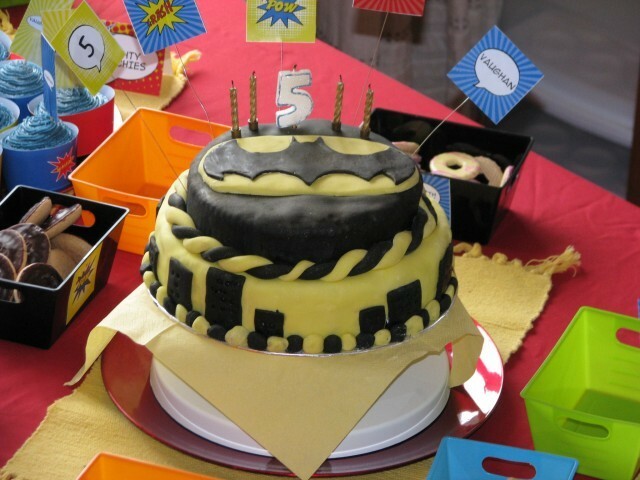 I hope you’ve enjoyed looking at these ideas and that you are inspired to throw your own superhero party. I’d love to hear what you think of our event so please feel free to leave a comment. 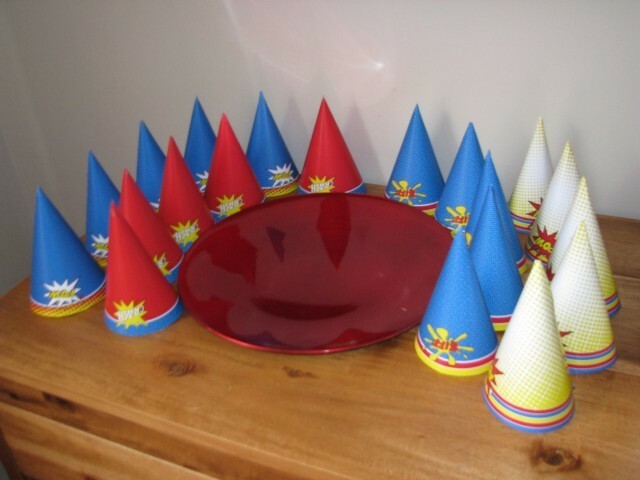 Please follow me on Pinterest for more party planning ideas!